100 hp AC motor soft starter, 75 kW three phase 230v, 420v, 480v, 690v for selection. Model GS2-075 (230v), GS3-075 (420v), GS4-075 (480v), GS6-075 (690v). Not all soft starters use a simple reduced voltage principle. For a number of years now, advanced soft starters (including the units manufactured by Gozuk), have used 'torque control' that produces a far better starting and stopping characteristic. 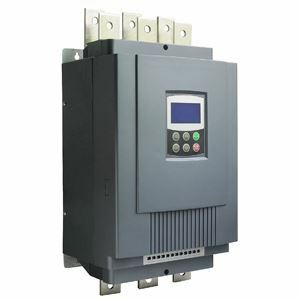 While variable frequency drives (VFD) produce excellent soft starting and stopping functions (sometimes with extremely low starting current), they are expensive solutions if variable speed is not required - particularly on large applications. Also, the skill level required to 'correctly' commission variable frequency drives is far greater than it is for soft starters. They both have their place and as a supplier and systems integrator for both technologies, we have to be smart enough to know which one to recommend to our customers.